First let’s just make it look better. For this you’ll need a clean (oil and grease free), soft, dry rag. 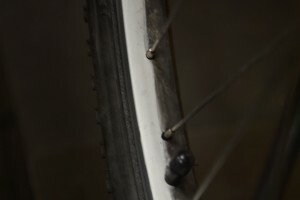 The easiest way to do this is right after a wet, soggy ride, as it will loosen up a lot of grime. Take your rag and wipe the brake surface until you see a nice silver color return. That’s it! 1. Find a clean rag, basic cleaner (household cleaners such as 409 and Simple Green work well), and rubbing alcohol. For really dirty rims find a Scotch-Brite pad and an old toothbrush too. 2. I find it’s easiest to clean wheels with the bike off the ground. If you don’t have a stand you can put the bike upside down on its seat and handlebar(be careful not to damage your seat or brake/shifter levers). You can take wheels off if you like, but it’s not necessary. 3. If they’re really dirty (your silver rim looks uniformly black) start here, otherwise skip to step 4. Spray the rim with your cleaner of choice, scrub the top surface with an old toothbrush, and braking surface with a Scotch-Brite pad. Once all that grime is loosened up, wipe the rim with the clean rag. 4. 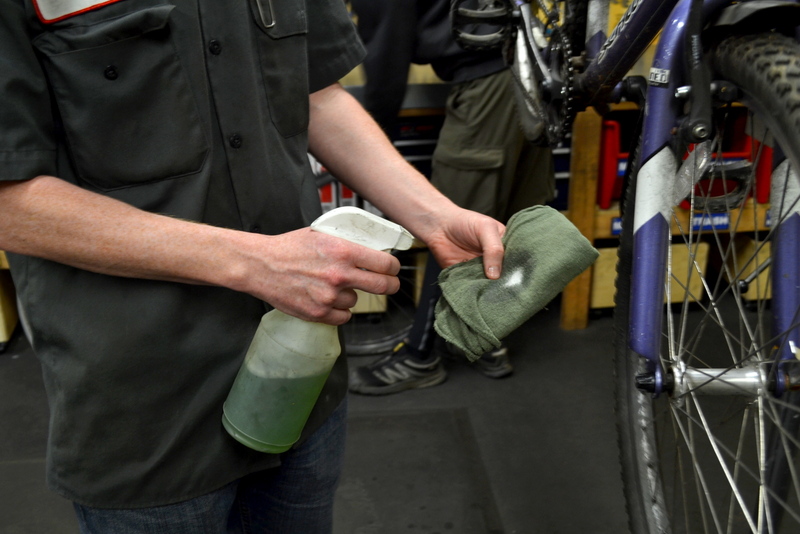 Spray cleaner on the rag and wipe both the braking surface and the top of the rim. Depending on how dirty the rim is you might not get them clean the first pass. 5. While you’re wiping take a close look at the rim and brake pads. 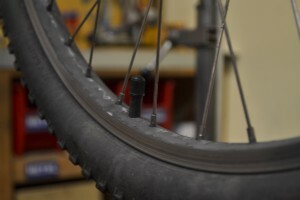 Make note of the rim profile; does it feel flat or concave? Look closely at the spoke/rim interface; do you see any tiny cracks? How do the brake pads look. Can you still see the grooves in the pad? 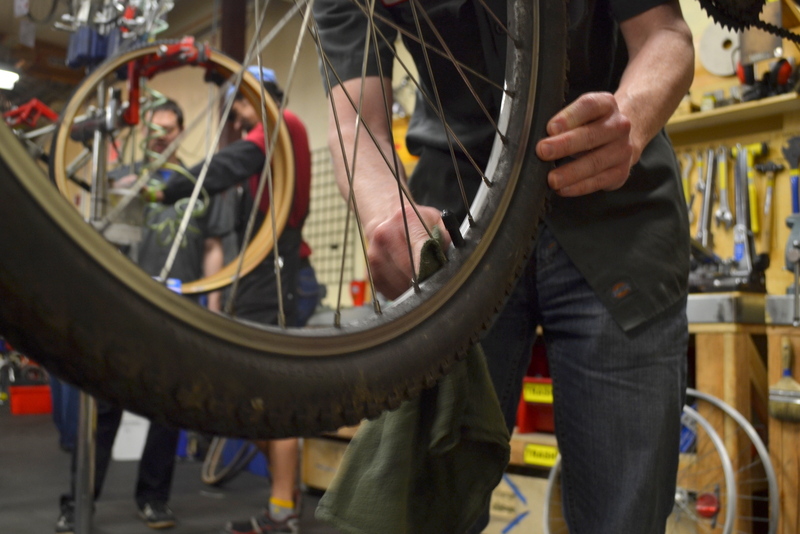 If the rim feels concave, looks cracked, or the brake pads have worn past their grooves, something could be worn and should be looked at by a mechanic. 6. Repeat step four (4) until the rim looks clean. When you’ve cleaned the big stuff off find the cleanest spot on the rag and wet it with rubbing alcohol. 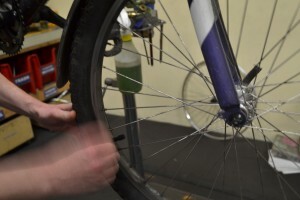 Give the braking surface one last wipe down to get the solvent residue off the rim. (Residue on the rim encourages brake squeal). You’re done! I bet your hands are really dirty too! Don’t worry about that, brake dust washes off easier than grease. If you have any questions or want a more hands on lesson stop by our bike shop and speak to one of our friendly mechanics.